The Ubaid period (c. 6500–3800 BC) is a prehistoric period of Mesopotamia. The name derives from Tell al-'Ubaid where the earliest large excavation of Ubaid period material was conducted initially by Henry Hall and later by Leonard Woolley. In South Mesopotamia the period is the earliest known period on the alluvial plain although it is likely earlier periods exist obscured under the alluvium. In the south it has a very long duration between about 6500 and 3800 BC when it is replaced by the Uruk period. The term "Ubaid period" was coined at a conference in Baghdad in 1930, where at the same time the Jemdet Nasr and Uruk periods were defined. Ubaid 1, sometimes called Eridu corresponding to the city Eridu, (5400–4700 BC), a phase limited to the extreme south of Iraq, on what was then the shores of the Persian Gulf. 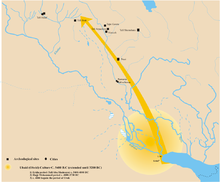 This phase, showing clear connection to the Samarra culture to the north, saw the establishment of the first permanent settlement south of the 5 inch rainfall isohyet. These people pioneered the growing of grains in the extreme conditions of aridity, thanks to the high water tables of Southern Iraq. Ubaid 2 (4800–4500 BC), after the type site of the same name, saw the development of extensive canal networks from major settlements. Irrigation agriculture, which seems to have developed first at Choga Mami (4700–4600 BC) and rapidly spread elsewhere, form the first required collective effort and centralised coordination of labour in Mesopotamia. Northern expansion of the Ubaid culture. Ubaid 3/4, sometimes called Ubaid I and Ubaid II — In the period from 4500–4000 BC saw a period of intense and rapid urbanisation with the Ubaid culture spread into northern Mesopotamia and was adopted by the Halaf culture. Ubaid artifacts spread also all along the Arabian littoral, showing the growth of a trading system that stretched from the Mediterranean coast through to Oman. Spreading from Eridu, the Ubaid culture extended from the Middle of the Tigris and Euphrates to the shores of the Persian Gulf, and then spread down past Bahrain to the copper deposits at Oman. The archaeological record shows that Arabian Bifacial/Ubaid period came to an abrupt end in eastern Arabia and the Oman peninsula at 3800 BC, just after the phase of lake lowering and onset of dune reactivation. At this time, increased aridity led to an end in semi-desert nomadism, and there is no evidence of human presence in the area for approximately 1,000 years, the so-called "Dark Millennium". That might be due to the 5.9 kiloyear event at the end of the Older Peron. Numerous examples of Ubaid pottery have been found along the Persian Gulf, as far as Dilmun, where Indus Valley Civilization pottery has also been found. Ubaid III pottery jar, 5300-4700 BC Louvre Museum AO 29611. Ubaid III pottery, 5300-4700 BC Louvre Museum AO 29598. Ubaid III pottery 5300-4700 BC. Louvre Museum AO 29616. Ubaid IV pottery gobelet, 4700-4200 BC Tello, ancient Girsu. Louvre Museum. Ubaid IV pottery jars 4700-4200 BC Tello, ancient Girsu, Louvre Museum. Ubaid IV pottery 4700-4200 BC Tello, ancient Girsu, Louvre Museum AO 15338. Female figurines Ubaid IV, Tello, ancient Girsu, 4700-4200 BC. Louvre Museum AO15327. Large buildings, implying centralized government, stated to be made. 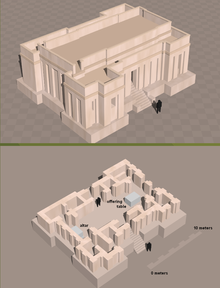 Eridu Temple, final Ubaid. Ubaid culture is characterized by large unwalled village settlements, multi-roomed rectangular mud-brick houses and the appearance of the first temples of public architecture in Mesopotamia, with a growth of a two tier settlement hierarchy of centralized large sites of more than 10 hectares surrounded by smaller village sites of less than 1 hectare. Domestic equipment included a distinctive fine quality buff or greenish colored pottery decorated with geometric designs in brown or black paint; tools such as sickles were often made of hard fired clay in the south. But in the north, stone and sometimes metal were used. Villages thus contained specialised craftspeople, potters, weavers and metalworkers, although the bulk of the population were agricultural labourers, farmers and seasonal pastoralists. During the Ubaid Period [5000–4000 BC], the movement towards urbanization began. "Agriculture and animal husbandry [domestication] were widely practiced in sedentary communities". There were also tribes that practiced domesticating animals as far north as Turkey, and as far south as the Zagros Mountains. The Ubaid period in the south was associated with intensive irrigated hydraulic agriculture, and the use of the plough, both introduced from the north, possibly through the earlier Choga Mami, Hadji Muhammed and Samarra cultures. Ubaid period pottery, Susa I, 4th millenium BC. The Ubaid period as a whole, based upon the analysis of grave goods, was one of increasingly polarised social stratification and decreasing egalitarianism. Bogucki describes this as a phase of "Trans-egalitarian" competitive households, in which some fall behind as a result of downward social mobility. Morton Fried and Elman Service have hypothesised that Ubaid culture saw the rise of an elite class of hereditary chieftains, perhaps heads of kin groups linked in some way to the administration of the temple shrines and their granaries, responsible for mediating intra-group conflict and maintaining social order. It would seem that various collective methods, perhaps instances of what Thorkild Jacobsen called primitive democracy, in which disputes were previously resolved through a council of one's peers, were no longer sufficient for the needs of the local community. Ubaid culture originated in the south, but still has clear connections to earlier cultures in the region of middle Iraq. The appearance of the Ubaid folk has sometimes been linked to the so-called Sumerian problem, related to the origins of Sumerian civilisation. Whatever the ethnic origins of this group, this culture saw for the first time a clear tripartite social division between intensive subsistence peasant farmers, with crops and animals coming from the north, tent-dwelling nomadic pastoralists dependent upon their herds, and hunter-fisher folk of the Arabian littoral, living in reed huts. Stein and Özbal describe the Near East oecumene that resulted from Ubaid expansion, contrasting it to the colonial expansionism of the later Uruk period. "A contextual analysis comparing different regions shows that the Ubaid expansion took place largely through the peaceful spread of an ideology, leading to the formation of numerous new indigenous identities that appropriated and transformed superficial elements of Ubaid material culture into locally distinct expressions." The earliest evidence for sailing has been found in Kuwait indicating that sailing was known by the Ubaid 3 period. Terracotta stamp seal with Master of Animals motif, Tello, ancient Girsu, End of Ubaid period, Louvre Museum AO14165. Circa 4000 BC. Stamp seal and modern impression: horned animal and bird. 6th–5th millennium BC. Northern Syria or southeastern Anatolia. Ubaid period. Metropolitan Museum of Art. Wikimedia Commons has media related to Ubaid Period. ^ Carter, Robert A. and Philip, Graham Beyond the Ubaid: Transformation and Integration in the Late Prehistoric Societies of the Middle East (Studies in Ancient Oriental Civilization, Number 63) The Oriental Institute of the University of Chicago (2010) ISBN 978-1-885923-66-0 p. 2; "Radiometric data suggest that the whole Southern Mesopotamian Ubaid period, including Ubaid 0 and 5, is of immense duration, spanning nearly three millennia from about 6500 to 3800 B.C." ^ Hall, Henry R. and Woolley, C. Leonard. 1927. Al-'Ubaid. Ur Excavations 1. Oxford: Oxford University Press. ^ Adams, Robert MCC. and Wright, Henry T. 1989. 'Concluding Remarks' in Henrickson, Elizabeth and Thuesen, Ingolf (eds.) Upon This Foundation - The ’Ubaid Reconsidered. Copenhagen: Museum Tusculanum Press. pp. 451-456. ^ a b Carter, Robert A. and Philip, Graham. 2010. 'Deconstructing the Ubaid' in Carter, Robert A. and Philip, Graham (eds.) Beyond the Ubaid: Transformation and Integration in the Late Prehistoric Societies of the Middle East. Chicago: The Oriental Institute of the University of Chicago. p. 2. ^ Susan Pollock; Reinhard Bernbeck (2009). Archaeologies of the Middle East: Critical Perspectives. p. 190. ^ Peter M. M. G. Akkermans, Glenn M. Schwartz (2003). The Archaeology of Syria: From Complex Hunter-Gatherers to Early Urban Societies (c.16,000-300 BC). p. 157. ^ Parker, Adrian G.; et al. (2006). "A record of Holocene climate change from lake geochemical analyses in southeastern Arabia" (PDF). Quaternary Research. 66 (3): 465–476. doi:10.1016/j.yqres.2006.07.001. Archived from the original (PDF) on September 10, 2008. ^ Uerpmann, M. (2002). "The Dark Millennium—Remarks on the final Stone Age in the Emirates and Oman". In Potts, D.; al-Naboodah, H.; Hellyer, P. (eds.). Archaeology of the United Arab Emirates. Proceedings of the First International Conference on the Archaeology of the U.A.E. London: Trident Press. pp. 74–81. ISBN 1-900724-88-X. ^ Jr, William H. Stiebing (2016). Ancient Near Eastern History and Culture. Routledge. p. 85. ISBN 9781315511160. ^ "Figurine féminine d'Obeid". 2019. ^ Pollock, Susan (1999). Ancient Mesopotamia: The Eden that Never Was. New York: Cambridge University Press. ISBN 0-521-57334-3. ^ Stein, Gil J.; Rana Özbal (2006). "A Tale of Two Oikumenai: Variation in the Expansionary Dynamics of Ubaid and Uruk Mesopotamia". In Elizabeth C. Stone (ed.). Settlement and Society: Ecology, urbanism, trade and technology in Mesopotamia and Beyond (Robert McC. Adams Festschrift). Santa Fe: SAR Press. pp. 329–343. ^ Carter, Robert (2006). "Boat remains and maritime trade in the Persian Gulf during the sixth and fifth millennia BC". Antiquity. 80 (307). ^ Brown, Brian A.; Feldman, Marian H. (2013). Critical Approaches to Ancient Near Eastern Art. Walter de Gruyter. p. 304. ISBN 9781614510352. ^ Charvát, Petr (2003). Mesopotamia Before History. Routledge. p. 96. ISBN 9781134530779.